Super Easy Spanish Lentil Stew with Chorizo 0 out of 5 based on 0 ratings. 0 user reviews. This Lentil Stew Recipe is one of my favourites because it is a perfect winter comfort food, easy to prepare, tasty and healthy(ish). Lentils are a top ingredient for winter recipes, low in calories and high in nutrition, and it would be a guaranteed success with everybody thanks to its original twist of spices that make the recipe special. When I started cooking, I used to pick up recipes on a famous cooking community website, Marmiton, which is very handy because it offers a great variety of homemade recipes that are suprisingly delicious and easy to prepare, usually with the ingredients that you have in the fridge. One of the great features is that you can save the recipes you’ve tried with personal comments in order to remember how you personalised the recipes. I go back sometimes when I search for recipe ideas, and that’s how I found this Spanish Lentil Stew with Chorizo recipe that I used to make very often, with a few personal enhancements. Since I tried it again at the beginning of the winter, I keep making it every week and really enjoy it. If you want to turn this recipe into a vegan recipe, just skip the chorizo, it would still be very good. First we make a tasty tomato sauce. Then the rest of the ingredients are incorporated to the sauce with water and cooked slowly in the sauce so that they can soak all the flavours. The same steps are used for the famous paëlla or rice recipes that are so appreciated in Spain. For this recipe, I prefer not to give any cooking time for the lentils because it varies a lot depending on the type of lentils you use. 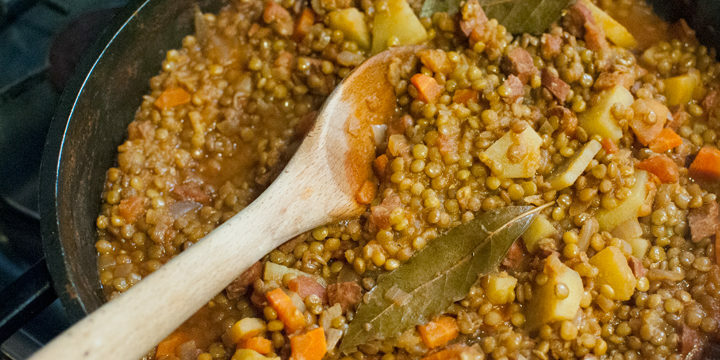 I would usually use the most common green lentils and the cooking time is around 45 minutes. If you want to cook them faster, you can soak them in water during 12 hours before cooking or cover the pan but just to be safe you should taste every 10 minutes the first time you make this recipe. Heat 1 liter of water in a kettle while you start cooking. Peel and chop the onion, carrot and potato in very small pieces. Warm the olive oil in a pan over low heat. 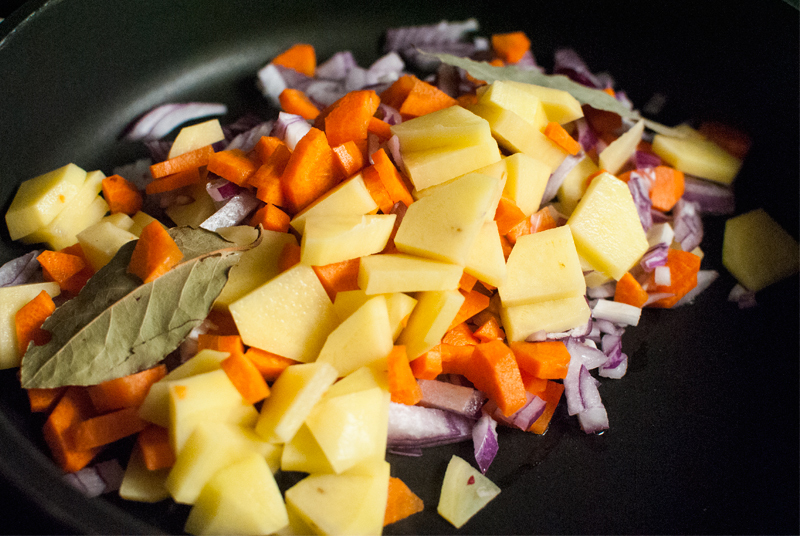 Sauté the chopped vegetables and the bay leaves in the pan over low heat for 5 minutes. 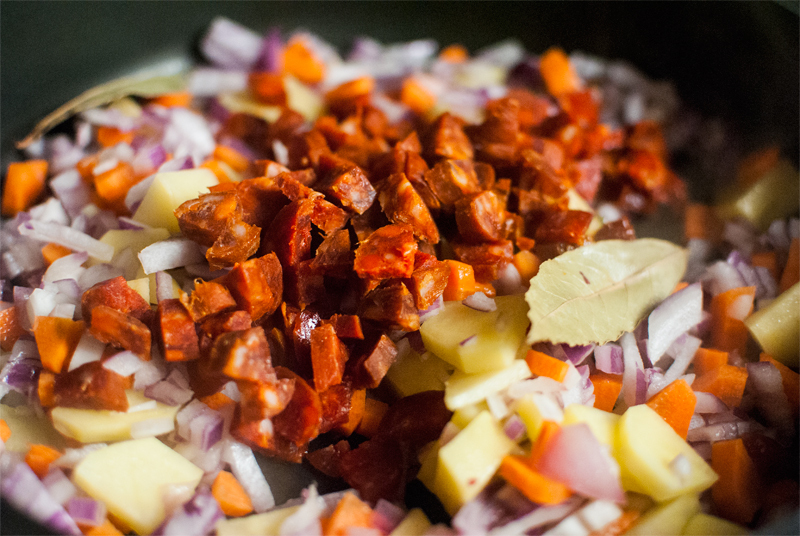 Cut the chorizo in tiny pieces and incorporate them to the vegetables. When the vegetables are soft, add the paprika, cumin and ginger and heat for a couple of extra minutes. 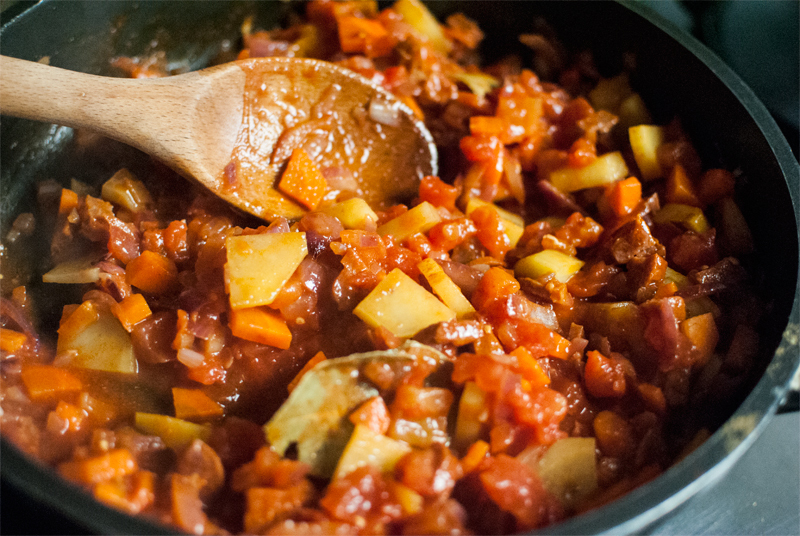 Incorporate the crushed tomatoes and heat for 5 minutes, stirring occasionally. 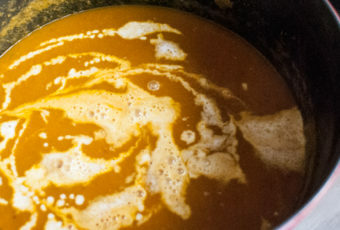 Add the lentils, broth cube and cover with the hot water. Stir all the ingredients and let cook over medium heat until the lentils are ready. 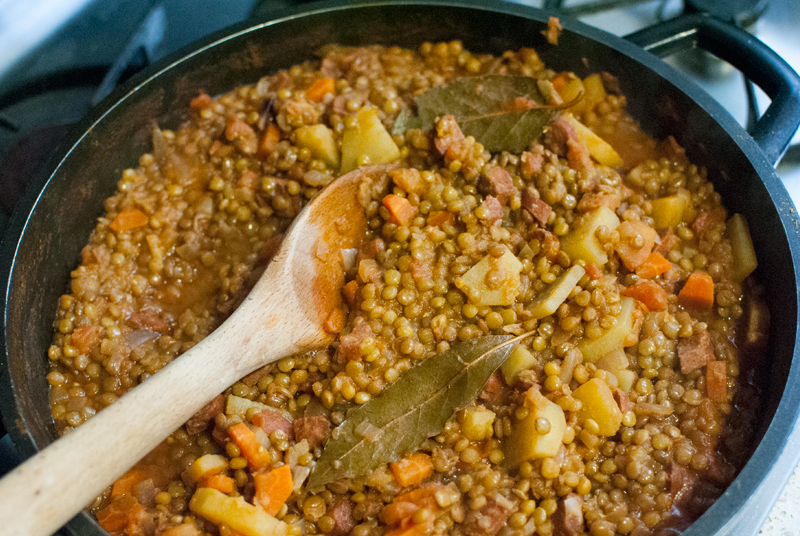 This can take until 45 minutes so you need to add more hot water if it evaporates before the lentils are soft. 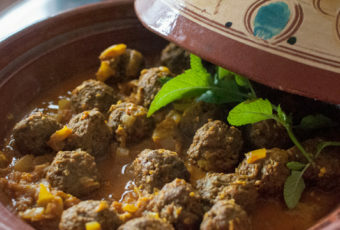 Really the quantity of water is at your taste because lentils absorbes a lot of water (so do not hesitate to be generous), and the stew can be more or less juicy regarding your taste. If you want to accelerate the cooking time, you can also cover the pan.